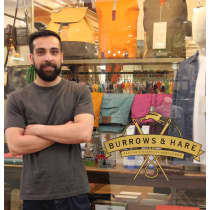 Burrows and Hare founder Junaid Ansari grew up around menswear fashion and retail, deciding to open his own store after seeing a gap in the Oxfordshire market. By curating a collection of timeless, high quality pieces, it has become a real destination for the discerning gentleman with an interest in craftsmanship as well as classic style. Alongside branded products, Burrows and Hare also stock their own collection, which is made in the UK and sourced from the best mills in the country. "I wanted to be able to offer our customer a variety of high quality goods that you often don't find in stores, focusing on expert craftmanship and materials rather than specific trends. Our philosophy is to encourage people to buy less and to invest in better quality."